Local businesses, municipalities and larger corporations are increasingly partnering with mobile shredding companies to host “Shred Days.” These events are used for customer appreciation, grand openings, and generally to earn respect and credibility from customers by protecting their information with on-site document shredding. There are several reasons why these events are gaining in popularity. The main reason is that they increase awareness of identity theft, America’s fastest growing crime. 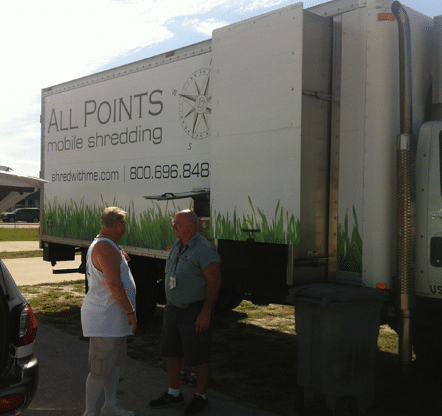 All Points Mobile Shredding has a state-of-the-art mobile shredding truck on-site to destroy confidential documents. 100% of the paper shred on-site at the events is recycled making these events green as well. Shred Days, also called Shred-A-Thons are offered for free to the community and often have a cause attached, giving them the added benefit of raising money for a local charity, school, or non-profit. Just last month, the Arati Hammond Real Estate Team of Re/MAX of Stuart partnered up with All Points Mobile Shredding and held a Shred Day at Hidden Oaks Middle School in Palm City. The event was free to the public and raised close to $1,000 for Hidden Oaks Middle School’s dance team. Arati Hammond and her team were so pleased with the turn out that they intend to make Shred Days a regular event. Identity theft experts agree that retaining confidential documents in the house or at works is a huge risk. And, disposing of such documents without shredding it first is a first class ticket to becoming a victim of fraud. Follow All Points Mobile Shredding’s on Facebook and Twitter to be informed of upcoming community Shred Days. You can click here to follow us. Or call us at 772.283.4152 to inquire about hosting your own event. ← Free Community Shred Day A Success!